The African wild dog, aka the painted hunting dog or Cape hunting dog, is one of Africa’s most misunderstood yet unique and enigmatic species. Although obviously a member of the canid family and related to foxes, dholes, dingos, wolves, jackals and other dogs, it has no close relatives and is the single member of the genus Lycaon, Greek for ‘painted wolf’. The name reflects the coloration – a distinctive but variable combination of irregular black, yellow-brown and white patches unique for every individual. A keen eye can quickly identify individual wild dogs from the distribution of white patches on the body and legs, and in their tail patterns, which tend to be brown at the base, with a black midsection and a white tip in differing proportions. But unless you’re fortunate enough to find a pack resting in the shade during the heat of the day, for they’re generally only active at dawn and dusk, the most usual sighting is an intermingling blur of shapes and colours flashing though the undergrowth. Historically packs were very large, sometimes around 100 adults, yearlings and pups – a very formidable hunting unit. Today packs average 8–12 adults and yearlings. But, irrespective of pack size, breeding is still dominated by an alpha male and female representing the backbone of pack structure and wild-dog social life. 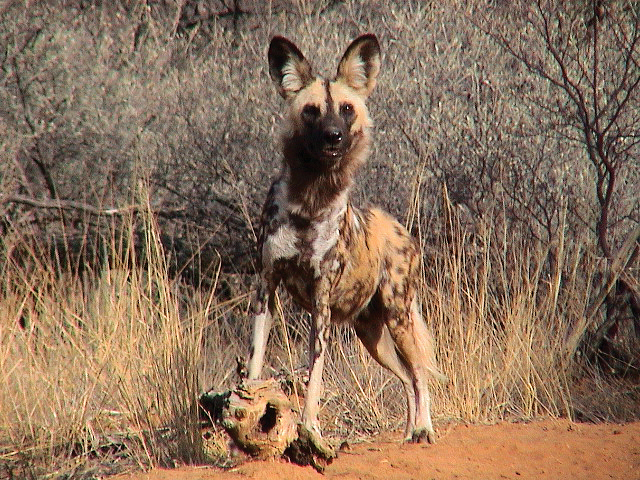 The alpha pair determines home range, which can exceed 3 000 km2 (twice the area of Greater London) in semi-arid areas such as north-eastern Namibia where the last wild dogs can be found. African wild dogs are a species of extremes. They expend the largest amount of energy of any of Africa’s large carnivores in their hunts, yet are the most successful hunter on the African continent, often successful in over 75% of hunts. 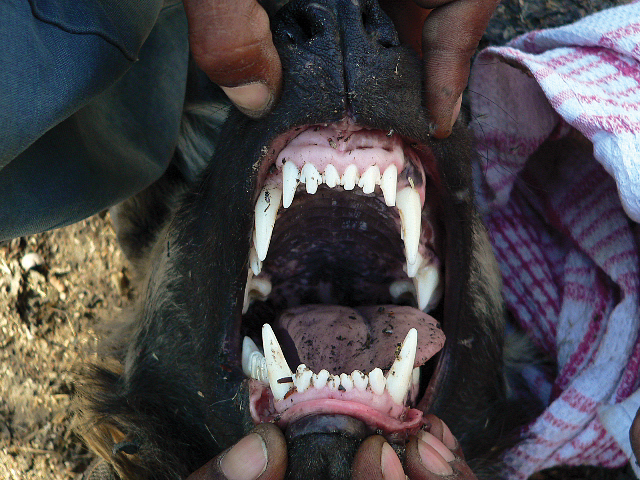 African wild dogs also have the strongest bite strength of any living carnivore for their weight. 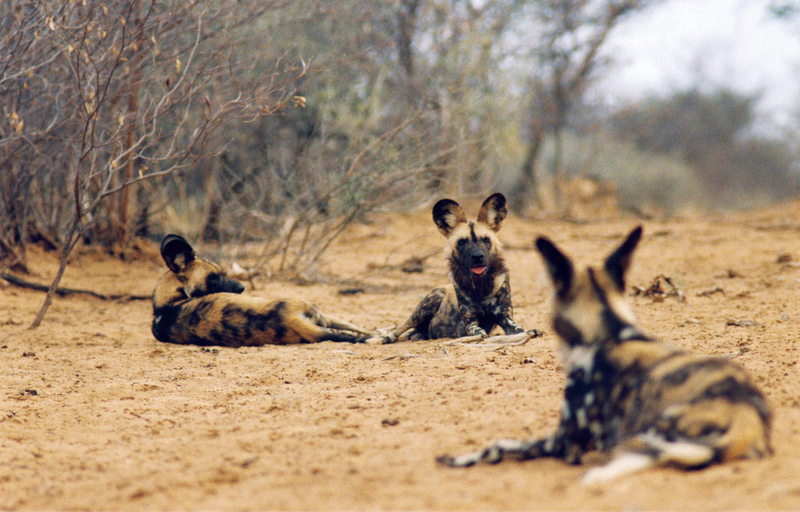 Co-ordinated pack hunting allows wild dogs to take down much larger prey than their individual size would suggest. Although they weigh between 20–30 kg, they can pull down an animal ten times their individual weight, such as an adult kudu bull or wildebeest. But usual prey is small to medium-sized antelope in the area such as duiker, steenbok and impala. It’s possible for an individual to eat a third of its body weight in a matter of minutes. Packs locate the prey by sight and run the animal down through supreme endurance, unmatched by any other mammal. Packs can maintain 45 kilometres per hour for 5 kilometres, but most hunts are over in 1–2 kilometres with chasing animals spreading out behind the prey, and cutting corners when the prey changes direction. Contrary to popular belief, the killing method of wild dogs by disembowelment is very fast compared to that of many of the large carnivores that kill slowly through strangulation. If the adults have young with them, they will back off after making a kill to give the yearlings and pups priority at the carcass. They eat quietly and without any aggression towards each other. 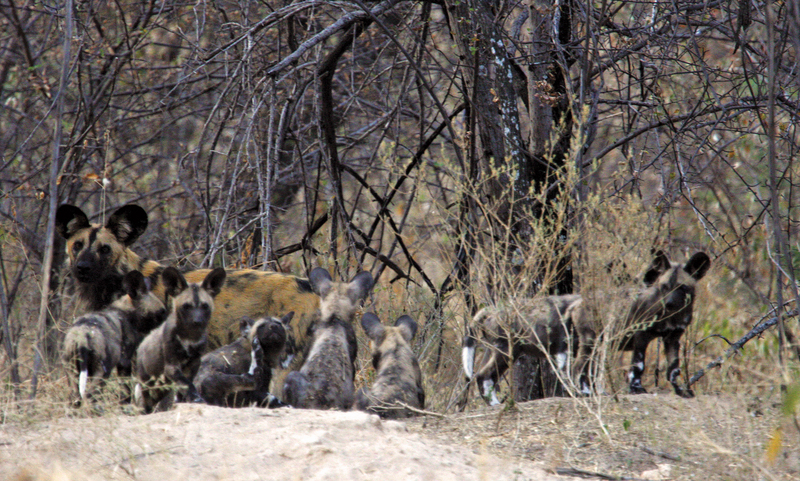 It is this behaviour that separates African Wild Dogs from many other large carnivores. Care for their young is paramount in wild dog society. Adults are known to starve to death to ensure the young survive. This largely explains the key to their conservation – the need for maintenance of functioning packs with hierarchal structures, where the old can teach the young, and the educated young can move away to start new packs, should pressure for resources become too much in their natal packs. For more than 100 years, misunderstanding and prejudice have resulted in widespread persecution of African wild dogs at the hands of farmers, game wardens and landowners, who perceived them as vermin. State-sponsored eradication policies, enacted up to the 1970s throughout the region, pushed the species to the verge of extinction. Their range was reduced by 95% and their numbers by 98% across the continent. The picture is largely similar in Namibia, with a pre-agricultural population of 25 000 reduced to the present-day 300. 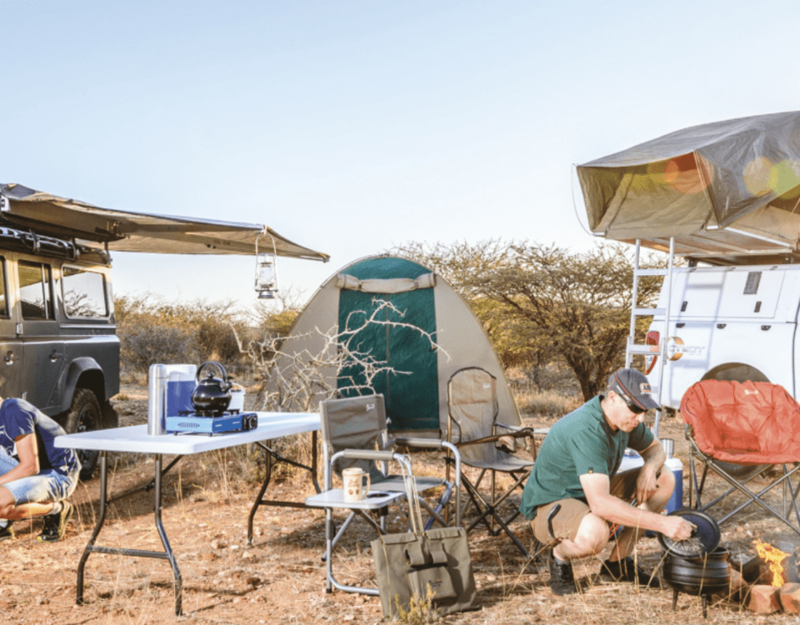 But while the picture looks grim for the dogs, there are some very encouraging opportunities for conservation intervention through reintroductions to their former range – specifically Namibia’s premier national park and tourism draw card – Etosha. In the 1920s the greater Etosha area, then four times the current size of 2.2 million hectares, was estimated to contain 2 000 African wild dogs. By the 1980s they were extinct as a result of persecution combined with disease outbreaks and a series of devastating droughts. Indeed, the African wild dog is one of only two extinct species from the park, the other being buffalo. But in actual fact African wild dogs are occasionally seen in the park, so there is hope for their recovery. Numbers are thought to be just below a threshold level by which new packs can form and recolonise the area. Consequently any sighting of an African wild dog in the Etosha National Park really is the absolute gold star in game viewing. In the meantime, if you’re keen to see the dogs in the wild, your best bet is either to visit the Nyae Nyae Conservancy, Khaudum National Park or Bwabwata National Park in the Zambezi Region where, if you are very lucky, you might just catch them running down the road at dawn and dusk. This article was first published in the Flamingo July 2009 issue.